Ever wanted a custom menu for you wedding??? That is exactly what Sixth Sense creates for you. We take into account our clients love of food to heart and create a menu for their special day with them. 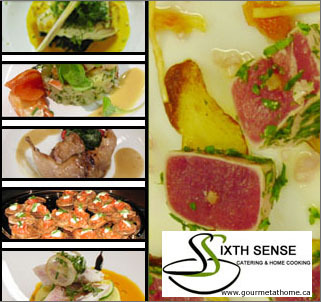 From a cocktail party, side down supper, buffet suppers, bachelor/bacheloret parties with cooking lessons to the dress rehearsal with only your family let Sixth Sense make that special day.